There were all kinds of interesting episodes connected with the planning of Aikido Kobayashi Dojo 40th anniversary celebrations, and I’d like to introduce several of these in a series of blogs. The first incident is connected with the design of the 40th anniversary commemorative T-Shirt. 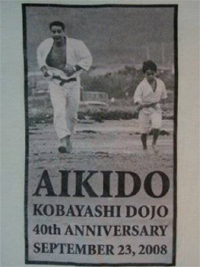 What kind of design would be appropriate for the 40th year celebration and reflect Kobayashi Dojo so that members would want to keep wearing the T-shirts? I have received a lot of T-shirts as gifts. I wear them as a duty when I get them but unfortunately there are many designs that I wouldn’t be caught dead in. I wanted a shirt we could sell with pride to all our members. Usually when we make dojo T-shirt, we borrow the photo of the founder, Morihei Ueshiba, and also his calligraphy. There were many designs submitted and I even tried my own hand at a design. We didn’t know what to do. We had to have a design everyone would be happy to wear. It was easy to talk about T-shirt logos but quite another coming up with one. 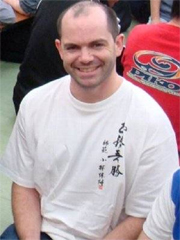 The vice-captain of Harvard university Aikido club, Corey spent 3 months at Tokorozawa Dojo two years ago. After he graduated from University he returned to Japan as a Junior High School English teacher in Kanazawa. During the summer holiday in August, he stayed at Tokorozawa Dojo again for two weeks. When Hiroaki and he were talking about T-shirt, Corey told Hiroaki that he designed the Harvard university Aikido club T-Shirt. Hiroaki also saw his beer mug, ball cap, towels, etc., all with Harvard Logo. Suddenly, Hiroaki got an idea, and asked Corey to design an appropriate T-Shirt for the 40th anniversary. *Translator's note: t-shirts are all sold-out. Sorry!